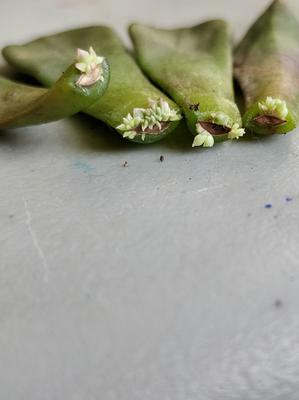 I propagated a bunch of black prince leaves because it had a root rot. most of them started growing but a lot doesn't have roots. They have many (pups?) on one leaf. Sometimes this happens, when they produce the pups first. Don't worry, the roots will follow. Leave the leaf on top of some cactus soil, with the base of the tiny plants close to the surface. Within a few weeks to a month, the tiny pink root hairs will emerge. You don't even need to water for this to happen. Once the little plants get a bit bigger, you can separate them, using a scalpel to cut them apart. They don't mind being crowded together, but eventually, the strongest ones will overshadow the weaker ones, and they'll die, or at least struggle. To get the most bang for your buck, you want to start to pull them apart early. You can use tooth picks to gently separate them, giving them more room while leaving them attached to the mother leaf for as long as possible. Put a tooth pick into the soil below the tiny plant, and stretch the plants out so they can get more light. Do this for a week or so, moving the tooth picks every day or so, until they show that they are self sufficient. After a few weeks of this you may be able to cut the biggest ones off and pot them up individually. Give them lots of light - a grow light is best. More on grow lights here. They are currently growing under a grow light but what do you mean by putting a toothpick under the soil? I don't really understand that part. Just stick a couple of toothpicks in between the leaves or tiny plants to pry them apart and give them more room.